We have reached Day #7 in our 12 Days of Wonder. 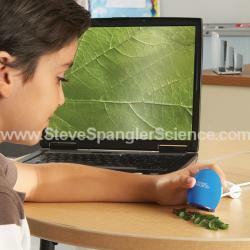 Today’s spotlight science toy is Zoomy Handheld Digital Microscope. Steve Spangler Science is celebrating the 12 Days of Wonder and highlighting our top 12 science toys and kits that are perfect to put under the tree. As blog editor, social media coordinator and mom of two budding scientists, I will share my review of each product. Steve Spangler Science also found 12 respected, popular mom bloggers to each test and review one of our 12 science gifts. I will include a link to their blogs and their honest reviews of each gift idea at the bottom of this post. Today, Kristin from Ziggity Zoom shares her review. The kit is also the Deal of the Day. So check our blog every day for the next few weeks to learn all about our 12 Days of Wonder. I was so excited to try this microscope when we began carrying it earlier this year. It’s a microscope that you can plug into your computer and look at the images on a big screen. No squinting one eye onto an eyepiece and moving a slide around to see what is under the microscope. With this microscope, you don’t even need slides. Put whatever you want to see up close under the viewer and it appears on the screen. You can even take videos. The microscope comes with software to install on your computer. I didn’t have any difficulties getting this to work. The one warning I do have for the software is the CD – it’s a small size so you need a ring to fit around it to get it into the drive. I’m not sure why the manufacturer put the software on the smaller CD other than to make it compact for packaging. The microscope will not work without a computer. It also comes with a USB cord and two scopes. It does not require batteries. I love this microscope. It’s small and fits in the palm of your hand. Children can also easily run it. We began by putting the microscope on our bodies. It magnifies up to 35x. Up the nose and in the ear were particularly interesting and disgusting. You see the human body from an entirely different perspective. You can take pictures by clicking a button on the screen or on the top of the microscope itself. You can also take videos complete with sound from the computer’s microphone. My girls began running around our kitchen grabbing bananas, potatoes and other food items to look at. The objects that they wanted to put under the microscope were limitless. The only difficulty we ran into was sharing the microscope and putting it away to finish homework. This is the perfect gift for a child (or adult) that is interested in the human body or just science in general. The microscope is rated for kids Pre-K to 12th grade. How many products can give that big of a range? This is the gift that will grow with your child and be used for years to come. It also makes the perfect teacher gift. I wonder what the inside of a nose on an overhead projector would look like. I know that class would definitely be engaged and fascinated. Many thanks to Kristin and Ziggity Zoom for testing our Zoomy Handheld Microscope. Visit Ziggity Zoom for family-kid friendly activities and printables. Follow them on Facebook and Twitter and don’t forget to check out their new app, Feed the Monster.